One weekend in the middle of Pokemon hunting with the wife, we decided to stop by Pink’s for a quick lunch. 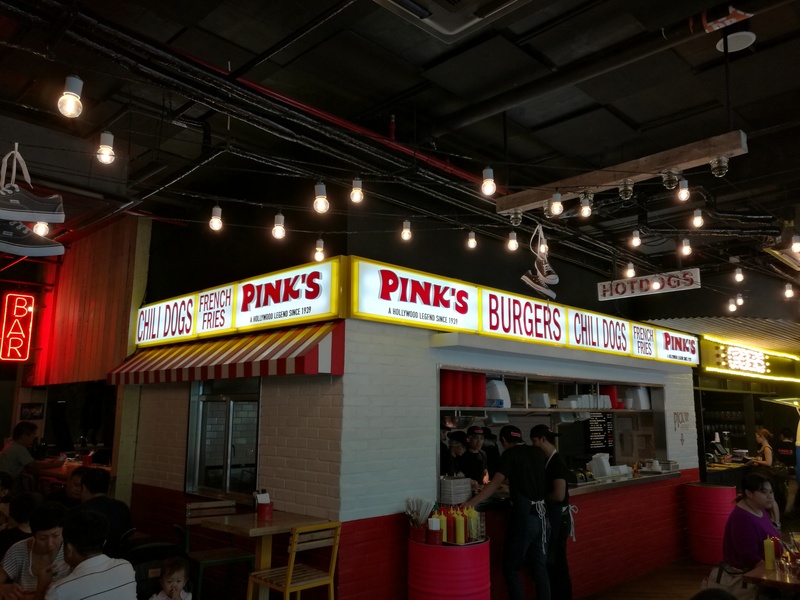 Pink’s is one of the established niche fast food places in Los Angeles. It may not be as big as McDonald’s but its relative small presence combined with a unique take on hot dogs make it one of the scene’s legends. If you happen to find yourself in the West Coast, this is certainly one of the places to stop by and grab a bite. Now, it finds it way half-way around the world for us to enjoy here in Manila. I got excited when I heard it was coming into town and curious if the food would still taste the same. Now to find it was the first challenge, akin to playing Pokemon Go. The location was slightly hidden from the edge of Bonifacio High Street. You would have to walk all the down to Central Square and cross the street to the Shangri La Hotel complex. It’s situated on the side of the building beside a manicured walkway / lawn. There’s no conspicuous signage dangling on the side, so you would really have to walk down and look for it along the row. What threw me a bit off though is the sanitized LA-food-truck-parking-lot ambiance the moment you enter. It didn’t help that the place was also situated within the same building of a 5-star hotel and expensive cafes. I just found it a bit odd with its attempt to upscale street food people line up for on the street. If this was sold like how the local Halal Bros. did it, that would have been a bit closer to its US counterpart. Based on taste, it does come close to the one in Los Angeles. It was slathered with toppings, and quite the treat. But value for money? Not quite. Most of hotdogs in the menu start at about P 250.00, which is already as good as decent meal in some sit-down casual restaurant. For an occasional specific craving of Pink’s, go right ahead. If you’re just after a ‘dog, you might be better off getting them big in S&R, or from nearby food court.